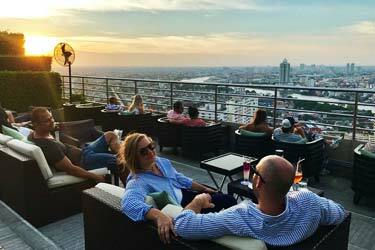 A complete guide to the 4 best rooftop bars in Abu Dhabi in 2019. You might come for the Formula One or some golf, but you should also remember to check out the best Abu Dhabi rooftop bars. For starters: Which are the best rooftops in Abu Dhabi? Below you'll find all the info you need about each rooftop. Opening hours, pictures, dress code, maps and so much more. 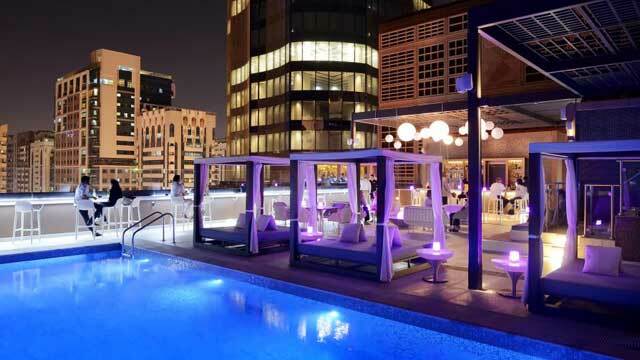 So, which is the best rooftop bar in Abu Dhabi? Here's a complete guide to 4 of the best places. Just scroll down and find the Abu Dhabi terrace best suited for you. Or use the Abu Dhabi rooftop map in the bottom right corner. 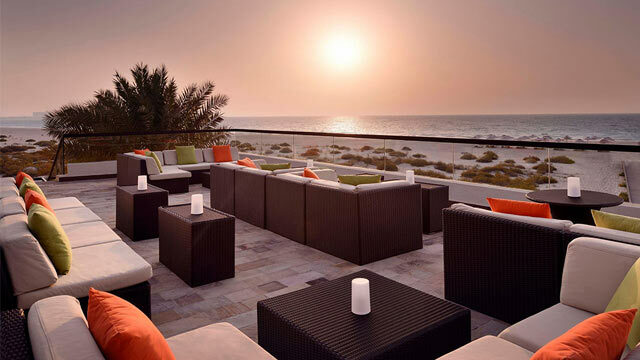 In front of the luxury Park Hyatt Abu Dhabi on Saadiyat Island you find Beach House Restaurant, and on top, the lovely Beach House Rooftop, offering panoramic views over the Arabian Sea and especially a sunset that is something extrodinary. The open air terrace is decorated with stylish lounge sofas, and here you really can feel as one with the surrounding natural elements. Perfect for a night away form the city buzz, where you can enjoy refreshing drinks, finger food or choose from a large selection of shisha, all in a great ambience. A chic and vibrant rooftop bar, located on the 12th floor of the great hotel Aloft Abu Dhabi, right next to Abu Dhabi National Exhibition Centre. From the terrace you get a great view of the city's outskirts and the Arabic Gulf. Both sleek and stylish indoor and outdoor lounge, the Relax@12 rooftop bar offers a large and very good selection of sushi along with great cocktails and a large array of other drinks. Come early for lounge vibes and sunset views and late-night for more vibrant rooftop party with live DJs and a great ambience. This luxurious rooftop bar is located on the 9th floor of Yas Hotel, right next to the Yas Marina Circuit, home of the annual Abu Dhabi F1 Grand Prix. One of the coolest roof terraces in the city in one of the coolest buildings. No panoramic views, but with lots of large and comfy sofas and a luxurious and sophisticated vibe, Skylite is the perfect place for relaxing lounge cocktails. Choose from a large selection of well made cocktails, some nice tapas-style bites, served in a trendy ambience with a resident DJ raising the atmsphere with lounge-style beats. A lovely and relaxed rooftop bar in Abu Dhabi, located on the 12th floor of the Courtyard by Marriott in downtown Abu Dhabi. 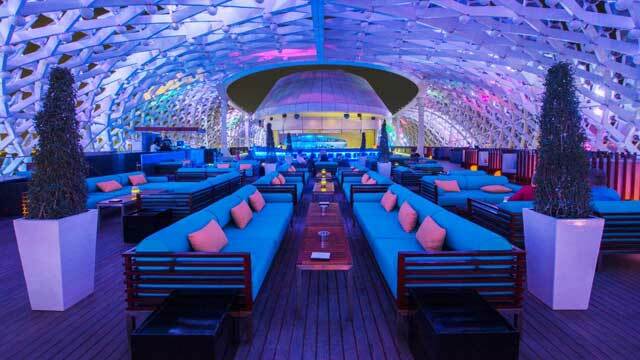 Refurbished during summer of 2018, so one the best rooftop bars Abu Dhabi has to offer just got a little bit better. Pool lounge by day and laid-back lounge towards the evening, this is a perfect spot for relaxing drinks with some good company. The rooftop bar menu includes crafted cocktails, draught beer and wines both by the glass and bottle, along with a food menu of bar-classics. Discover the biggest collection of Abu Dhabi activities, guided tours and skip-the-line tickets. Anything you want you'll find right here. The climate here is warm all year round which means the rooftop bars in Abu Dhabi can stay open all year around. The Abu Dhabi terraces are often luxurious with a contemporary décor and magnificent views over the city and its surroundings. Prices goes hand in hand with the rest of the city, so pretty expensive in other words. 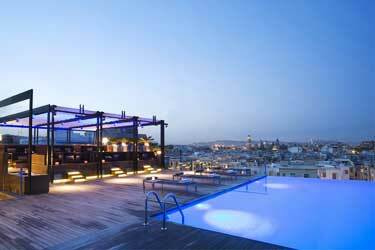 Most of the roof bars and restaurants here, are located out near the sea, close to the city center. 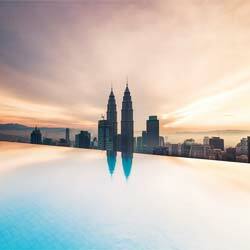 Resulting in that it is smooth and easy to travel between the various rooftop-bars without too much occupants. The typical place in Abu Dhabi to drink with a view at, is located at a hotel with views over the Arabian Gulf. There's not a lot rooftop bars in Abu Dhabi so far, but those who are, are of very good quality. The city is still being built out, so expect a lot of new skybars in Abu Dhabi ahead. You can find more info about the city here. Abu Dhabi is the capital of the United Arab Emirates and the largest of the seven emirate’s that make the country. 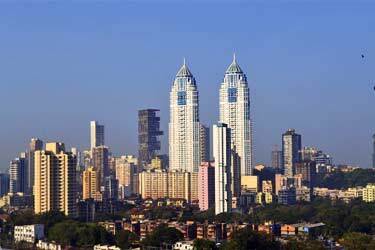 About 1 million people live here, of which 83% are foreign workers. 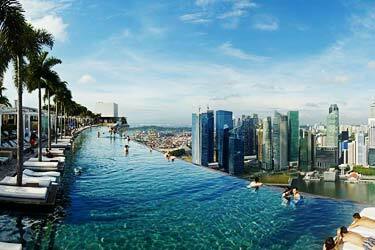 Abu Dhabi is one of the "richest" cities in the world and the city is growing fast every day. Every year a Formula 1 Grand Prix takes place here that attracts crowds of tourists, celebrities and wealthy people. Most rooftop bars in Abu Dhabi is very luxurious, which also is reflected in the food and drinks that can be enjoyed on the roof terraces. 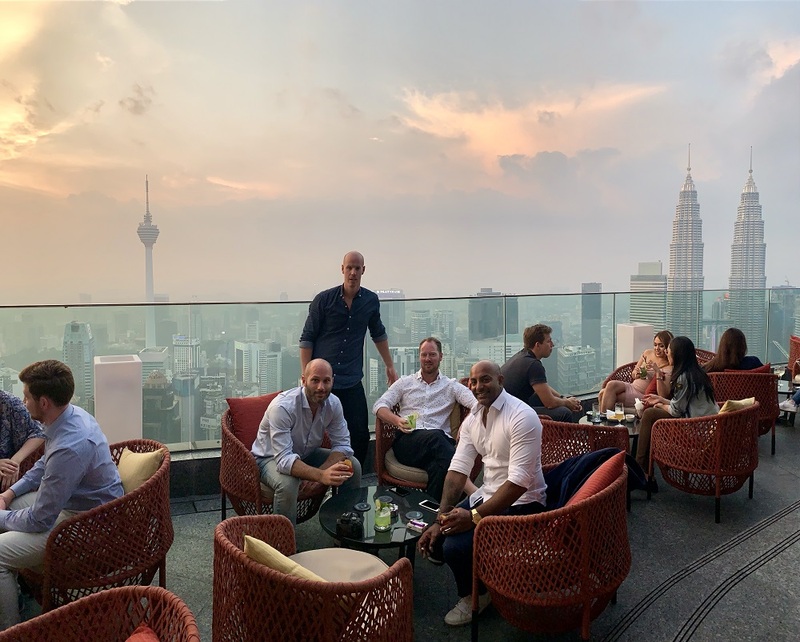 The drinks are of high class almost any rooftop bar you visit, and the same goes for the food on the rooftop bars which has restaurants. Usually people drink classic cocktails, beer and wine here. As with much else in Abu Dhabi, the prices are quite high even up on the terraces. Despite the city's many skyscrapers, most of the rooftop bars in Abu Dhabi are at a relatively low level - compared to how tall the tallest buildings are here. The outlook from the roof can vary, both magical views of the Arabian Gulf and the sunset to the views of Abu Dhabi's skyline and the city's rooftops. 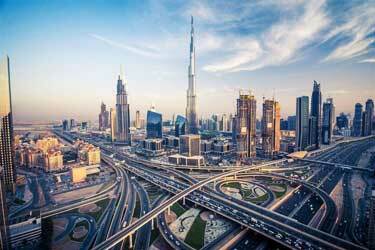 Abu Dhabi is starting to become a rather popular destination for tourists. An event that attracts a lot of visitors each year's Formula 1. Once a year, a Grand Prix is held here. Then enthusiasts, wealthy people and media people gather here to take part of the lovely atmosphere. 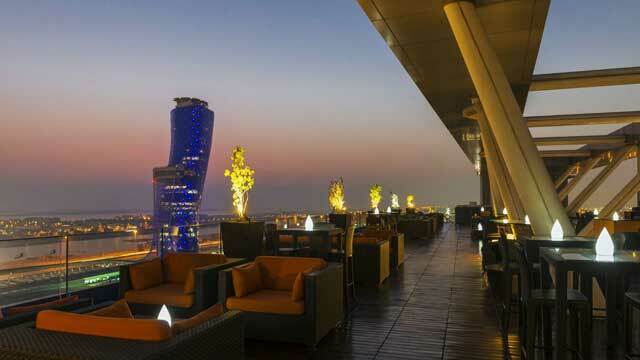 A perfect time to visit some of Abu Dhabi's rooftop bars. 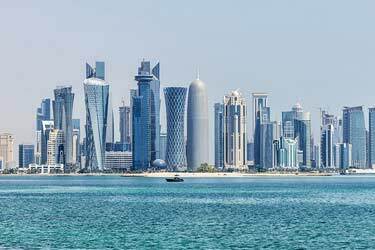 Other attractions include Sheikh Zayed Mosque, Hotel Emirates Palace, Abu Dhabi Falcon Hospital, Yas Waterworld Abu Dhabi, Observation Deck at 300, The Corniche, Saadiyat Public Beach, Yas Mall, Mushrif Central Park and Ferrari World Abu Dhabi if you believe TripAdvisors toplist. 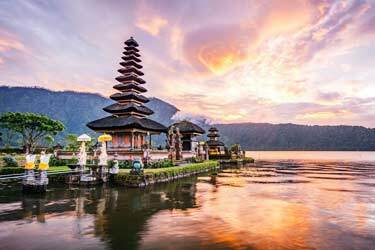 Given that the city is very newly built and modern in comparison to many other cities in the world, you can find lots of luxurious and fine hotels. There are many optiones for the choosy ones. Both central and close to the water. Some of them with cool rooftop bars. Many flights runs to Abu Dhabi and the airport is very central, making it easy to both fly here and then get from the airport to any of the rooftop bars in Abu Dhabi.